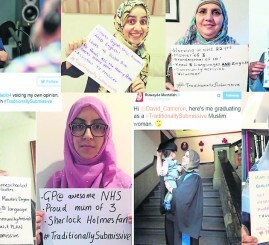 Over 30,000 Muslim women of all ages and from all walks of life took to Twitter last month to slam Prime Minister, David Cameron, for suggesting that they are “traditionally submissive”. They did so in the most imaginable British way, sarcasm. When David Cameron, launched a review of the Muslim Brotherhood it coincided with the arrest of its leaders in Egypt and the removal of the country’s only democratically elected President, Mohamed Morsi, in a military coup. Many have since been either sentenced to death or given life imprisonment in a series of summary trials. Muslims have faced barrage of unfounded accusations, tarnishing all with the same malicious brush. It has left the bogus image that every Muslim is a potential terrorist, if not already a suicide bomber. One of the most contemptible and damaging techniques has been the use of the so-called “Us and Them” thesis to divide the world up into opposing groups. Defence Secretary, Michael Fallon, MP, told an invited Muslim audience that the air strikes against Daesh [IS or ISIL] was not a war against Islam. Not for the first time the former head of equalities watchdog has entered the fray in castigating Muslims, claiming that the community was unlike others in Britain and the country should accept that they will not integrate in the same way. In an exclusive interview with The Muslim News, Galloway said he wants to be Mayor of London for the downtrodden. Over 80 mosques across the UK opened their doors to thousands of Britons on February 7, as part of annual ‘Visit My Mosque’ Day. The Government’s long-awaited review into the Muslim Brotherhood in Britain came and passed without the findings of the two-year investigation being published. Our readership nominated them, and our distinguished independent panel of Judges reviewed, deliberated and mused over the list and here they are. A panel of judges completely independent of the newspaper and its editors selects the shortlist and winners of The Muslim News Awards. The judges reflect the diversity of experience, background and gender. The University of Westminster has been accused of infringing students’ privacy after it installed CCTV cameras in Muslim prayer rooms “and Multi-faith quiet rooms” without consulting the Students Union (UWSU) in September 2015. A man racially abused an 81-year-old pensioner as he walked to a mosque in the early hours of August 10, before launching a vicious attack with his friend, a court has heard. An umbrella organisation representing mosques in Lancashire will operate a helpline for victims of Islamophobia starting from February 26 after a report by Lancashire University recommended third party assistance in the reporting of hate crime. A Muslim man from Derby who was removed from a Morocco bound flight minutes before take-off, says he was targeted because he was bearded Muslim. Nelson Mandela’s eldest grandson, “Nkosi Zwelivelile” Mandla Mandela, married Rabia Clarke in a private Muslim ceremony. Employers are often asked to provide references in respect of former employees, and these can throw up a range of issues as the amount of detail that they should provide. BOOK REVIEW: Africa, a continent of promise and potential unfulfilled? The African Renaissance and the Afro-Arab Spring. Ed. by Charles Villa-Vicencio, Erik Doxtader and Ebrahim Moosa. Washington DC: Georgetown University Press. Pp225. PB. 2015. £22.76. El Nino, the weather pattern that occurs every two to eight years, when ocean temperatures in the eastern Pacific rise, affecting temperatures and weather patterns around the globe, might have had an effect on mosquito numbers. The World Health Organization (WHO) has declared the Zika virus a global public health emergency. Leicester is set to offer Riyad Mahrez a new contract in the summer to see off interest from the Premier League’s top clubs.